Gov. 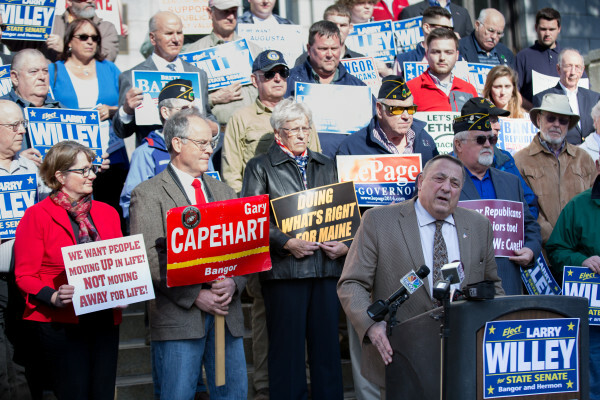 Paul LePage speaks during a candidacy announcement for Republican N. Laurence Willey Jr. for the District 9 state Senate seat in April in Bangor. AUGUSTA, Maine — The slate of Republican candidates for the general election in November took shape Tuesday in a primary election that saw low voter turnout throughout most of Maine. Some of the primary elections on the GOP side highlight a political divide between two of the state’s top Republicans: Gov. Paul LePage and Senate President Mike Thibodeau. That divide flared publicly at times during the past two years, particularly during the debate over a state budget bill in 2015, when Senate Republicans followed a more fiscally moderate path than did LePage. LePage has said openly that he opposes at least two incumbent lawmakers vying for the Senate: incumbent Republican Sen. Linda Baker of Sagadahoc County, who competed in a primary battle for the District 23 seat with Guy Lebida of Bowdoin; and Republican Rep. Joyce Maker of Calais, who sought her party’s nomination in the Washington County District 6 seat against Republican William Howard III, a Calais city councilor. “We need to weed them out,” LePage said of some moderate Republicans during a speech at the Maine Republican Party Convention in April. The governor has endorsed Lebida and Howard and unofficials results had Lebida winning and Howard losing. Early Wednesday morning, it appeared that LePage had succeeded on that count in one Senate primary. In District 23, Baker lost to Lebida in a contest decided by 40 votes. She conceded Wednesday morning. In District 6, Maker led Howard with 68 percent of the vote with 48 of 52 precincts reporting. The Kennebec County Senate seat vacated by Republican Sen. Earle McCormick of West Gardiner was the subject of a primary between Gardiner City Councilor Maureen Blanchard and retired U.S. Navy Rear Adm. Bryan Cutchen of West Gardiner. With seven of 11 precincts reporting, Cutchen held a comfortable lead — with almost 62 percent of the vote. He will face Democrat Shenna Bellows, who won a primary Tuesday, and independent Joe Pietroski in November. District 14 is seen by Democrats as a prime pickup opportunity in their efforts to retake the majority in the Senate. Another seat vacated by a sitting Republican is in District 2 in Aroostook County. Sen. Michael Willette is not seeking re-election, creating a GOP primary race between Rep. Ricky Long of Sherman, one of the most conservative members of the House of Representatives, and Emily Smith, who runs a farm and serves on the Presque Isle City Council. With 32 of 47 precincts reporting at midnight, Long led Smith 52 percent to 48 percent, according to unofficial results. — In House District 2 (Kittery area), Jane Robbins led Jonathan Michael Moynahan with 64 percent of the vote and two of three precincts reporting. — In House District 77 (Oakland area), Michael Perkins beat Kelly Couture with 55 percent of the vote and all precincts reporting. — In House District 90 (Damariscotta area), Roberta Mayer beat Anna Morkeski with 82 percent of the vote and all precincts reporting. — In House District 91 (Waldoboro area), Abden Simmons led Melvin Williams with 55 percent of the vote and three of four precincts reporting. — In House District 92 (Thomaston area), Sonja Sleeper beat Kyle Buck Murdock with 56.5 percent of the vote and all precincts reporting. — In a three-way primary in House District 96 (Palermo area), Ryan Harmon won the race with 58 percent of the vote, followed by 25 percent for Robert Currier and 17 percent for Richard Light, with all precincts reporting. — In House District 107 (Skowhegan area), Anne Amadon beat Newell Graf Jr. with 69 percent of the vote and all precincts reporting. — In House District 145 (Sherman area), Roger Bouchard led Chris Johansen, capturing 53 percent of the vote with 16 of 18 precincts reporting. Republicans hold a 20-15 majority in the Maine Senate. The House includes 78 Democrats, 69 Republicans and four independents.